Lindy Hemming, an Oscar winner whose costume designs have appeared in the Harry Potter movies and every James Bond since GoldenEye, was brought in by director Christopher Nolan to create the new Batman costume that Christian Bale would wear in Batman Begins. In keeping with the film’s theme, her inspiration was a prototype military suit that Bruce Wayne would alter and modify into his first Batman costume. This morning, Lindy stopped by Entertainment Weekly to discuss the totally revamped Batman costume we’ll be seeing in next summer’s Begins sequel, The Dark Knight. 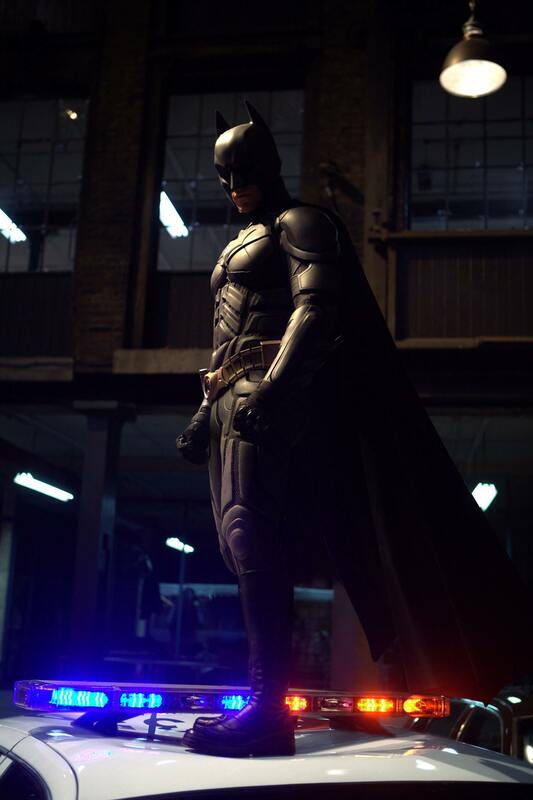 In the photo, Batman is standing atop a Gotham City police car. For the new costume, Lindy took the neck all the way up Christian Bale’s own neck. The mask section is a separate piece that fits over his head and lines up with the neck piece. So it’s two separate sections that look like one, allowing Bale to move his head easily and more freely. The costume is both sleeker — and in some ways, busier — than the Begins suit. It reminds me in some ways of samurai armor, which struck a perfect balance between protection and mobility. It still looks like it would protect him from Gotham’s worst while a) allowing for more agility than the previous suit and b) showing off more of Bale’s natural physique. It’s functional and realistic while still retaining all the classic Batman elements. And they kept the awesome utility belt from Begins! As always when big new Batman news is on the table, massive thanks go out to Bill “Jett” Ramey and his Batman on Film website. Jett had the Batman picture yesterday, but sat on it until today because he wanted to honor Entertainment Weekly’s scoop. Other sites ran a scan of the photo that someone with an early copy of the magazine sent in. And though Jett could have published it first, he stuck to his guns and didn’t steal Entertainment Weekly’s thunder. That takes honor and integrity and guts, and I’m happy to see that those things still exist on this big, crazy internet. Well played, sir. And nicely done. And so it is, folks. Please stop by Entertainment Weekly’s website and read Lindy Hemming’s awesome comments about the new Batman suit or, better yet, pick up the issue that hits newsstands today for a closer look. It’s a good day to be a Batman fan, isn’t it? The Dark Knight and his rockin’ new costume will zip-line into the theater near you on July 18, 2008! 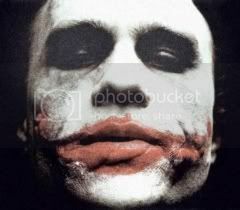 Holy crap the Joker looks scary! This is totally random, but I love that he’s wearing more combat type boots instead of the designer girly boots in the last films. I cannot wait for this film! Bale Batman in his new batsuit that lets him move in all the right ways, defend damsels and innocents, AND show off his natural physique ON TOP OF A GOTHAM CITY POLICE CAR? It’s a mighty fine day for Batman fans indeed. And I second your, “Well played, sir. And nicely done,” to “Jett.” Batman would be proud. Darn, the pic isn’t online anymore. Anyone got another link? The link is fixed now. Thanks for letting me know. Sorry about that! Wow, thanks for fixing that! Much appreciated. I think your copy of that pic is the only one I can find that doesn’t have the EW text on it.